Besides analyzing the meteorites on Earth, ASIAA astronomers have been pointing our telescopes, SMA and TAOS, to study comets in distant space. 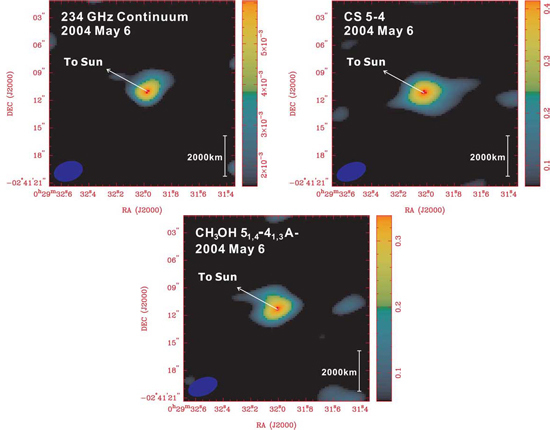 We have carried out SMA observations of Comet C/2002 T7 (LINEAR) during its 2004 apparition at 1.3 millimeter. With an angular resolution of 3".2x1".8, which corresponds to a linear resolution of 1500x900 km when the comet was at a distance of 0.61 AU from the Earth, we successfully detected and imaged the 234-GHz thermal dust continuum, as well as the spectral emission of CS and methanol emission from the inner coma. This was the first comet observation ever conducted by the SMA.